Hypochondriacs, rejoice. 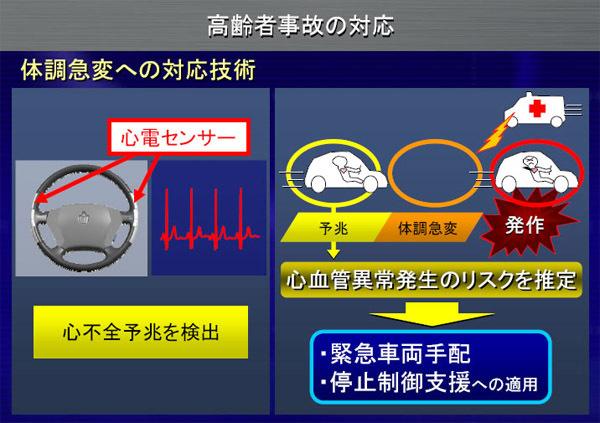 Toyota is reportedly working on a steering wheel with an electrocardiogram (ECG) built in. In the future, your car will be able to tell you if you have arrhythmia–or even if you’re having a heart attack. The setup is simple: Contact sensors embedded in the steering wheel detect abnormal heart rhythms via the driver’s hands. Toyota recently showed off a Prius outfitted with the steering wheel to a group of reporters at one of its Japan facilities, according to Medgadget. The ECG info was shown on the in-car navigation screen–meaning that one day, you could casually check your heart rate along with the weather and local news. Toyota isn’t the only automaker that wants to put health-related technology in its vehicles. Ford is also working on a car seat with a built-in heart rate monitor, which can measure the human heartbeat through clothing without any need for skin contact. Why, you may ask, would you possibly need to know your heart rate while in a car? A daily reading of your heart could result in patterns that might not be seen at your less-than-annual physical. Perhaps more importantly, with the number of Americans aged 65 and older projected to more than double by 2050, it’s not unreasonable to expect the amount of in-car health incidents to increase accordingly. If a vehicle can detect that a driver is having a heart attack, alert him to pull over, and then automatically call 911, many lives could be saved. No word on when Toyota plans to release its heart attack-detecting steering wheel, or whether it will be an optional add-on for health-conscious drivers.